So it’s getting on to be another long stretch since the last update, so I would like to start by apologizing for that! We have just been so busy these past weeks that it has been very difficult to find the time to focus on an update. Let me try to catch you up! 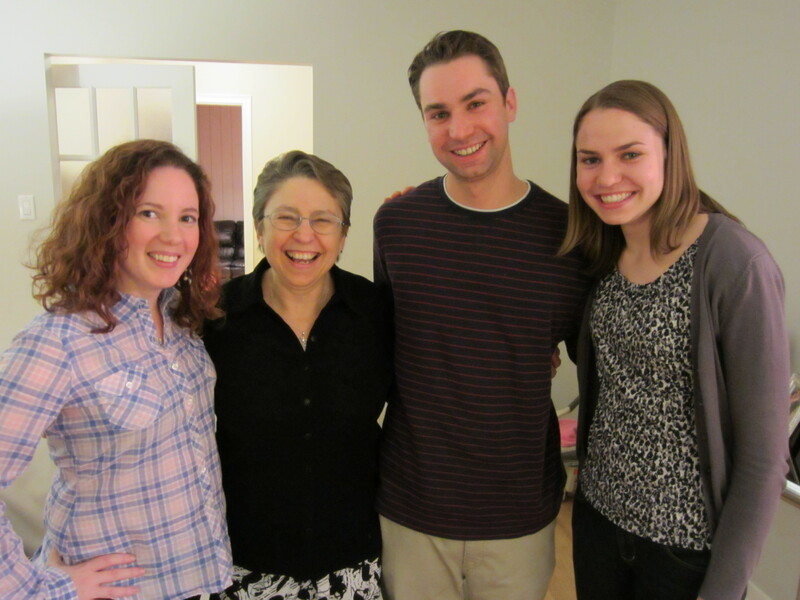 Easter weekend came with much excitement, Lauren’s Auntie Marlena came to visit from NYC and Nonna came over from Belleville! 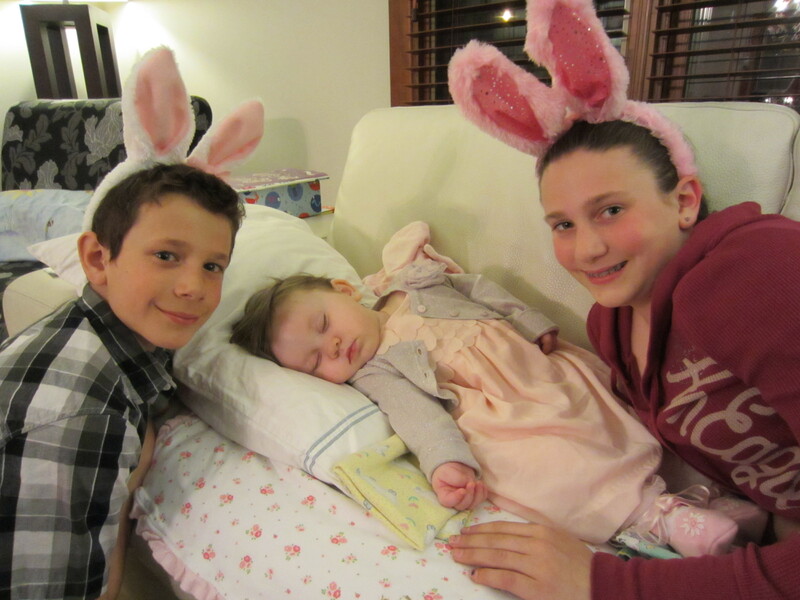 Lauren enjoyed their company but had been experiencing a lot if pain, so much so that we ended up having to give her a low dose of morphine on Easter Sunday so that she could rest comfortably. By the time my family stopped by for desert that evening (cousins Julia, James, Grandma, Grandpa, Auntie Linda and Uncle Roger) she had fallen asleep. She was so peaceful for the first time in days, I think that she still knew that everyone was here to visit her, and could hear all the noise around her. She was very happy. 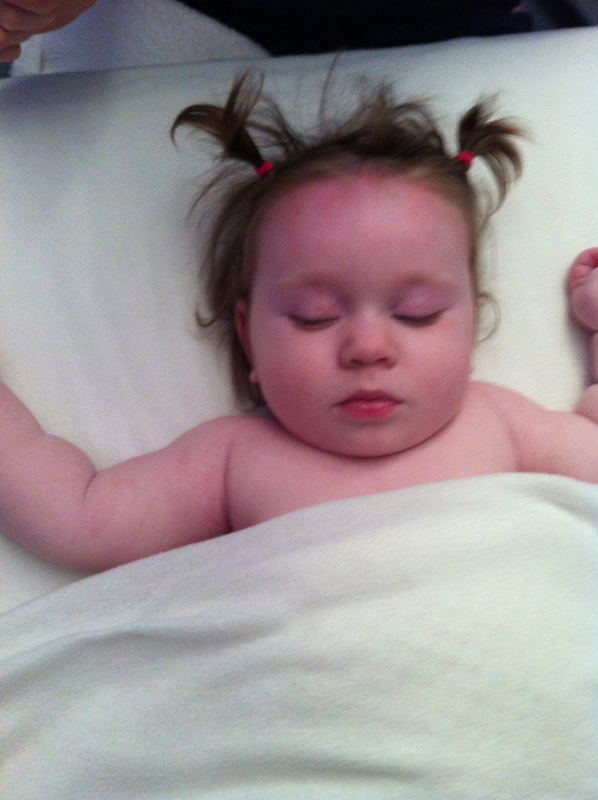 Oh and a quick mention, this Easter – April 8th marked Lauren’s 15 month Birthday! Happy Birthday my little Princess! Later that week we packed up and went to Pittsburgh to visit Lauren’s study doctor. We initially feared travelling with Lauren since she has hated being handled lately, but I’m happy to say that with a small dose of morphine she was quite comfortable and made for a very good traveller. Security was also amazing, once they heard about Lauren’s condition they didn’t make us take her out of her car seat and stroller, they just checked her out as is, leaving her a happy little lady. Much better than the blood curdling screams that would have unleashed otherwise. 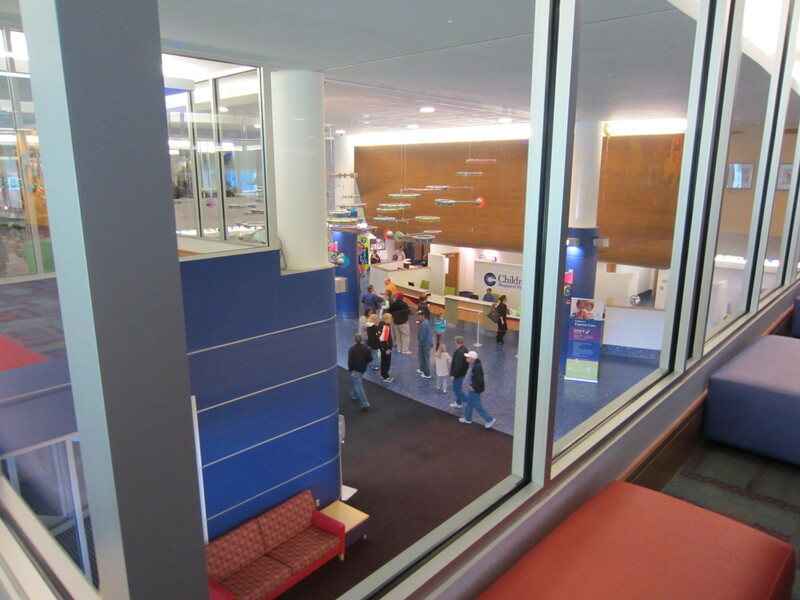 We were in Pittsburgh for three days, the first day in clinic was a really busy one. We started our morning with a 6:45am MRI, followed by some time in clinic with our doctor who was able to check Lauren out and assess her. We then we went for two more tests at the children’s hospital and concluded our day with an interview with CTV Edmonton via Skype. The interview was to help spread awareness in Edmonton for a family who was hoping to come to Pittsburgh with their children for treatment, it’s very expensive and they are trying to raise money to afford the procedure. 6:45 am, the perfect time of day for an MRI - surprisingly we look awake! On the second day that we were there we had the opportunity to meet with two families that had also been affected by Krabbe disease. 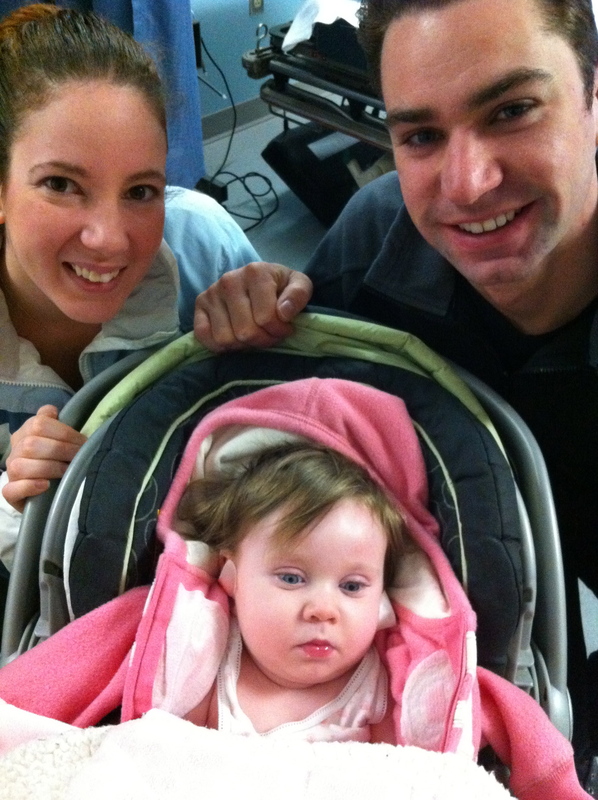 At the children’s hospital (which was the nicest hospital I’ve ever seen or dreamed of seeing) we met up with the Smith’s who’s gorgeous 7 month old daughter Lily had just undergone a cord blood transplant. The transplant will give her more time and will slow/stop the progression of the disease. Unfortunately the transplant can’t give back the damage that has already been done by the disease but Lily is a strong little girl, full of life. Having the transplant done although lifesaving can be a very difficult road to recovery – Chemotherapy is done prior, and the transplant is followed by an 8 month recovery (in hospital). You can check out Lily’s Facebook page here http://www.facebook.com/LittleLilyGrace We pray every day for this cutie to have as comfortable a recovery as possible. That evening we met up with the Changle’s a family who had lost their boy Dylan. Dylan had an early infantile form of the disease and passed at eight months old, four very short months after diagnosis. 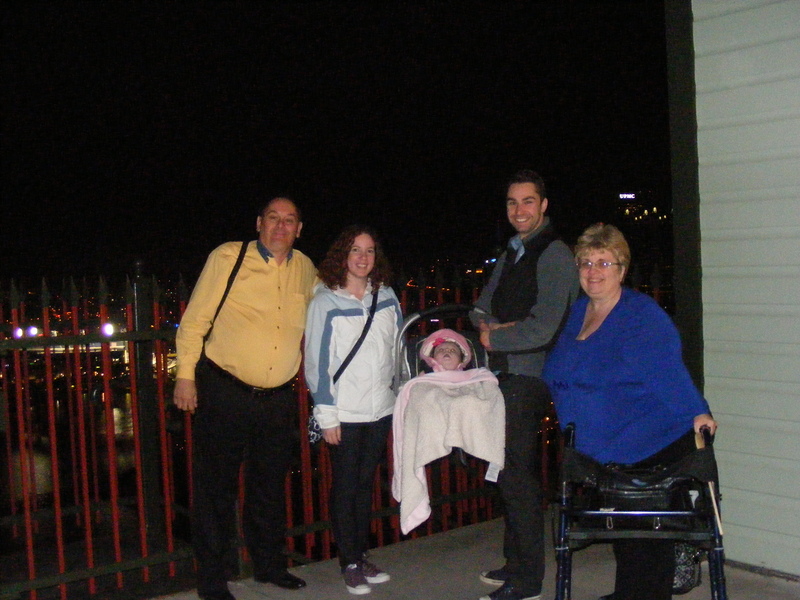 We enjoyed a very nice dinner overlooking the city of Pittsburgh. The conversation though difficult at times was warm. They shared stories about Dylan and we shared our experiences with Lauren, by the end of the night Stephen and I left feeling like we had shared dinner with our family, rather than a family that we had just met. Although we are so sad for their loss, we found comfort in their strength and ability to live positively after losing a child. I often wonder how we will go on when Lauren leaves us, we have poured so much of ourselves into our little one that I worry at times that there wont be much left when she’s gone. 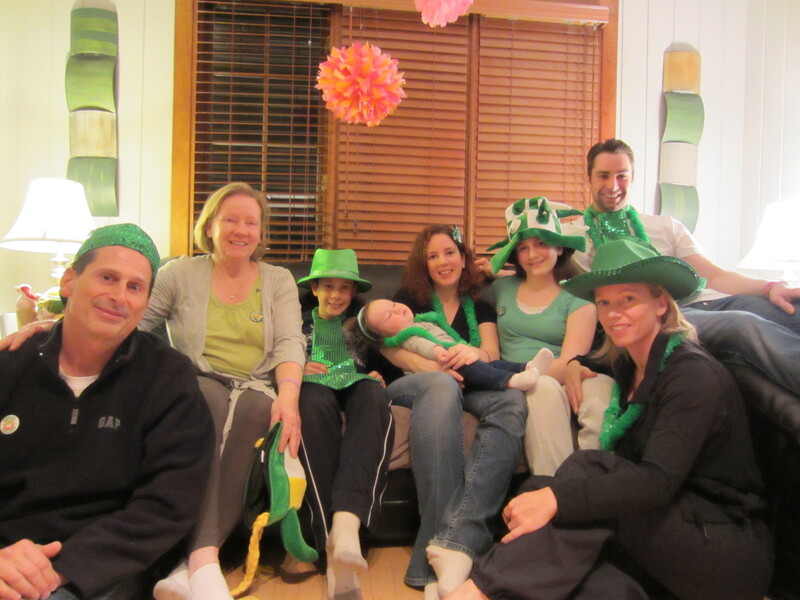 This family continues by honouring Dylan through “Dylan’s Quest for the Cure”, a foundation that works with the United Leukodystrophy Foundation to raise money to support research into a cure for Krabbe Disease. Upon arriving home from Pittsburgh we had our family over to visit with Lauren and to Celebrate my Big Brother’s Birthday. Of course I have to post a picture here of him with his baby niece! 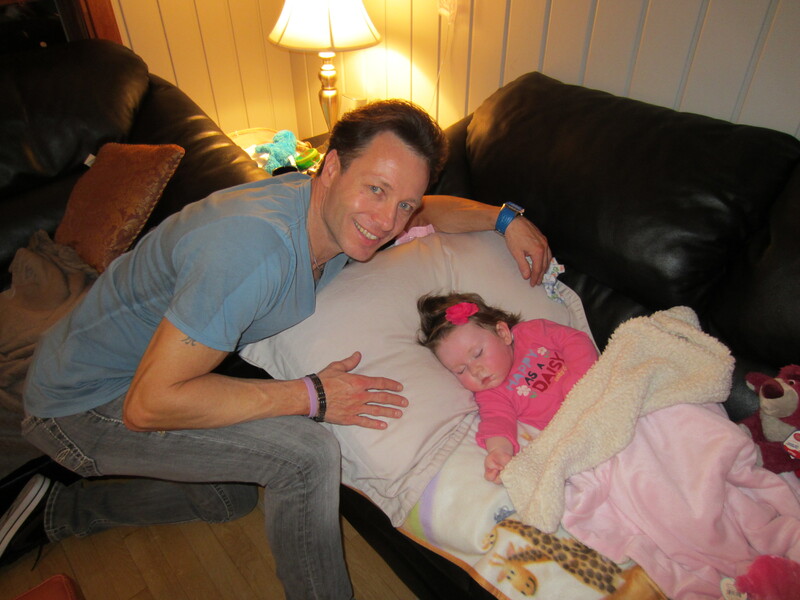 Uncle Dave with Baby Lauren, she partied so hard that she had to take a nap! Since arriving home so much has happened, but I will try to keep it to the most exciting stuff. 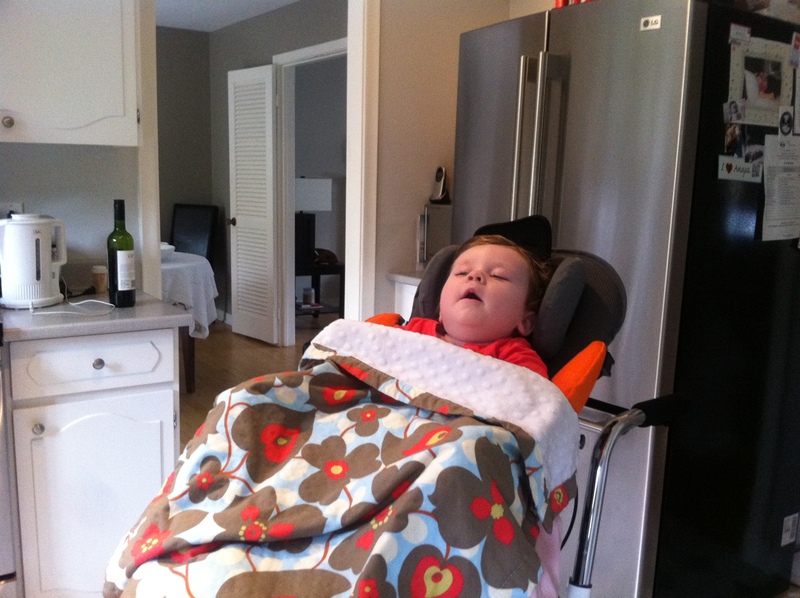 Lauren hanging out in the kitchen enjoying her new Kimba seat, check out the smile! 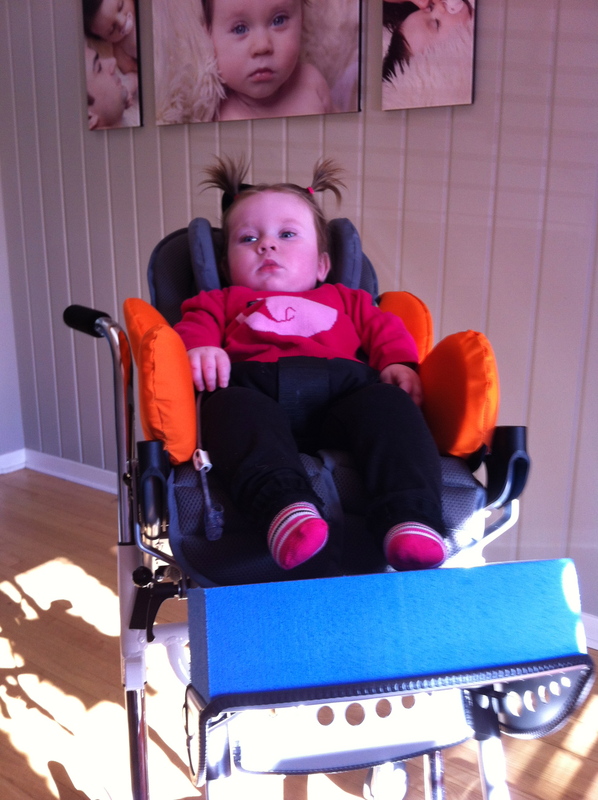 #1 – Lauren’s Kimba Stroller and home base have arrived! Lauren seems to love her new seat and can spend hours watching us from it. Now we have the freedom to move her from room to room comfortable and best of all Lauren is getting to experience different sensations, smells and views from her new chair. She has joined us at the dinner table, and has watched daddy cook up a storm in the kitchen. #3 Lauren still loves massage! Mommy has even started to take Baby massage classes with her. #6 Almost forgot! Lauren got her new hand splints. 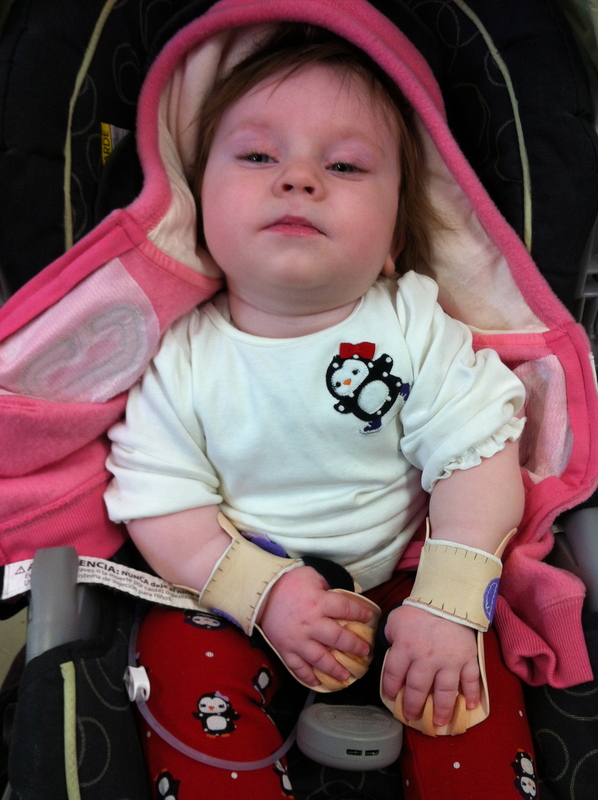 As a child suffering of Krabbe disease, Lauren has her fists clenched almost all day, this can get really uncomfortable. The hand splints will help relieve her hand a little. I’ll post some pictures below of Lauren enjoying her favourite therapy/activities. I wanted to end the blog with an update on Lauren’s health. Believe me when I say that Lauren is still full of life! She has been surprising us with little Laughs and smiles since arriving home. That being said, the disease has continued its course. Our Doctor in Pittsburgh had mentioned to us in the beginning of December that Lauren’s Vision would most likely go within the following six months. Eerily enough she was right on with her prediction, Lauren struggles to see. Lauren can only track at a 25 degree angle, can focus on lights and shiny things but has trouble with solid colours. Lauren also experiences a delay in processing what she is seeing, so faster moving objects may be missed. Stephen and I have bought some toys that light up and are easy for Lauren to follow. We have also learned that Lauren sees best when an object is accompanied by sound. 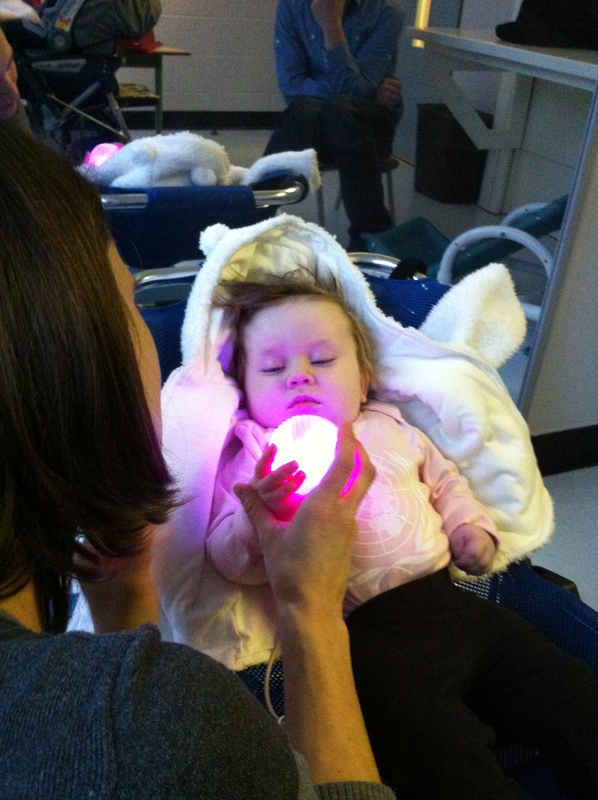 Great news since a lot of baby toys come with light and music! Lauren still hates being moved from one place to the next, but she has allowed Steve and I (and even Grandma!) to hold her. It’s a wonderful feeling. The only thing is that it’s uncomfortable for her if you have to get up and move her later on, I’ve quickly learned to take bathroom breaks and reserve a couple of hours for holding her and nothing else. She has lost almost all voluntary movement. 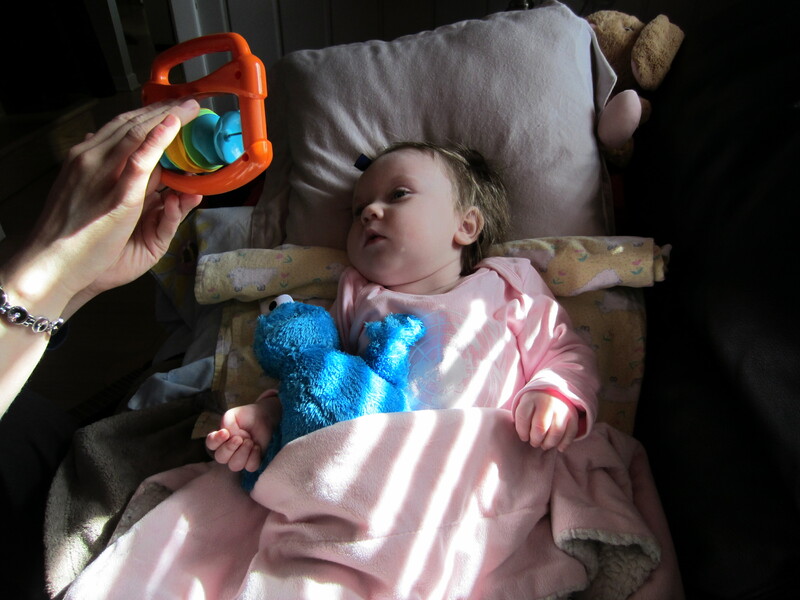 She can only move her arms slightly, allowing her to play with her sensor toy from the rehab centre. The good news is that she is still a smart little lady and seems to understand when we speak with her and even enjoys little games that mommy plays with her. As an example she loves when I tell her that I’m going to give her a kiss, then make kissie noises as I approach her slowly. A lot of the time when I finally get close up she will let out a small laugh. Lauren's new hand splints - doesn't she look like she's getting a manicure? So relaxed after a massage from Lucia! 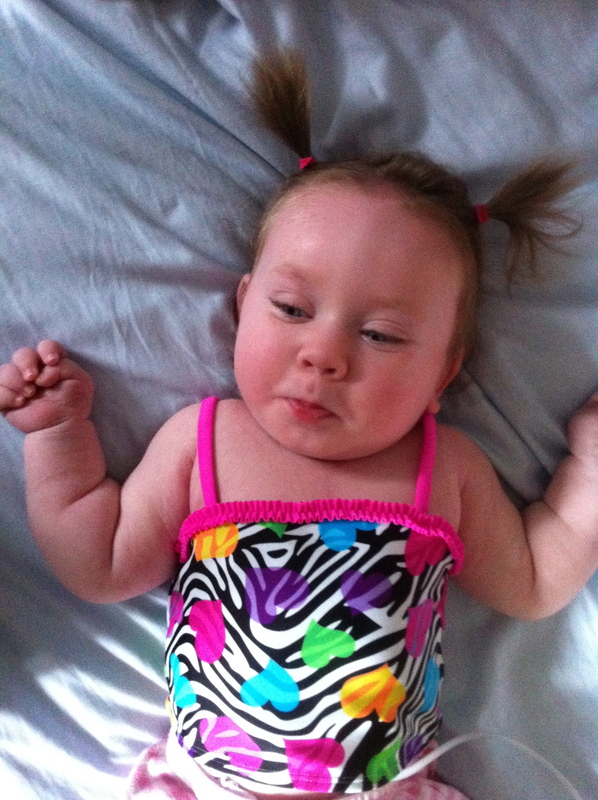 Lauren in her Kimba, Notice the beautiful Photo's by Jenn Munro in the background.